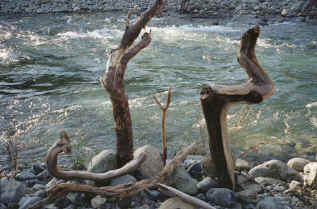 Our driftwood floats down river from the mountains, settling along the river's banks in our back yard when the water level goes down. Each piece of driftwood is gathered by hand for its unique qualities, either its beauty or its unusual size or shape. As you can see, the driftwood works beautifully for your birds to perch on. let us know if you are interested in a piece of driftwood.